Science of the Saints, 27-XII-2018 (14 Dec.), The Holy Martyrs Thrysus, Leucas, Philemon, Appolonius, and Callinicus. 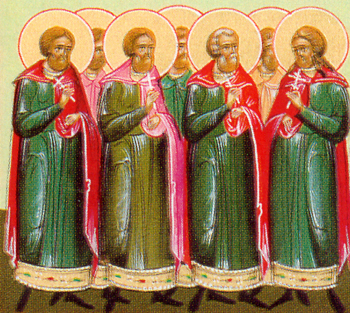 The Holy Martyrs Thyrsus, Leucas and Callinicus suffered for Christ under the emperor Decius (249-251) at Bithynian Caesarea. Saint Leucas, having reproached the governor Qumvricius for his unjust persecution of Christians, after torture was beheaded by the sword. Saint Thyrsus, sentenced to cruel tortures and torments, endured them unharmed and by the will of God he died peacefully. The pagan priest Callinicus, having seen the bravery and the miracle involving Saint Thyrsus, believed in Christ and boldly confessed the true faith, for which he was beheaded by the sword. Previous Previous post: Science of the Saints, 26-XII-2018 (13 Dec.), The Holy Martyrs Eustratius, Auxentius, Eugene, Mardarius, and Orestes. Next Next post: Science of the Saints, 28-XII-2018 (15 Dec.), The Holy Martyr Eleutherius.